[regression] scale/spread: "Initiate Window Picker for All Windows" does not show all windows. It shows only windows from current workspace. compiz expo plugin have the option to change the scale plugin behavior but that does not work unity Unity..
that setting is being overridden by Unity since super+w only shows windows from current workspace. - As the change request conflicts with bug #689733 , the current default behaviour of the spread should not change. Also significant changes to Ubuntu's default behaviour should not be made in a SRU. - In the medium term this functionality will be replaced by 'The Spread'. See http://design.canonical.com/2012/03/task-switching-in-ubuntu-and-a-introduction-to-the-spread/ and also http://design.canonical.com/the-toolkit/unity-task-switching/ for more details. Please discuss feedback on these designs in the comments of the design blog post linked to above that announced this feature. and then it will be easy for users to choose the behaviour that suites them best. "initiate windows picker" for current workspace . + "Super + W" window picker only shows local windows, not all. summary: - "Super + W" window picker only shows local windows, not all. Also affects me on Precise Beta 1, compiz 0.9.7.0. This is a bug other than Unity team decide to use this behavior as the default. The mistake here is that the unity team instead of change the default shortcut for the 1st way from "shift + alt +up" ---> "Super +W" they change the behavior of the 2nd way to act like the 1st. So what we have now is #1 and #2 acting exactly the same , only picking windows from the current workspace which is wrong as we have lost the ability to initiate the picker for "all windows"
This bug is also producing side effects in other functions. I had a weird experience today, where I had two windows for the same app open. (chrome) One was minimised while the other was not. When I clicked the icon, expecting to see scale of both windows or at least a window and an icon (for the minimised window). I got scale for the active window only and show desktop was initiated. I thought I'd "lost" all my desktop widgets. It took me a few minutes to figure it out as I never use show desktop because it doesn't respect the desktop setting on my widgets. For the sake of completeness my widgets consist on conky and screenlets both of witch have a desktop setting. Same here using the current 12.04 Beta. Initialize scaling for all windows only shows the windows on the current workspace. Also seems to affect Expo plugin settings. I typically have Scale set to show windows from all workspaces when mouse pointer goes to bottom right corner, and expo activates on bottom-left corner. Also, I enable Scale-Addons. I can manually set all of these things, and they work until I restart X. My guess is that some Unity configuration replaces all of my Compiz settings. 3. on a third workspace click the terminal-icon on the launcher. It will take you to the non-minimized terminal. The only way to find the minimized terminal is by either remembering the workspace on which you minimized it or by checking the small triangle to the left of the terminal icon on every workspace. So this also breaks the application spread behavior. This bug also affects scale hot corners - when any hot corner is assigned to reveal all windows in all worspaces, only windows from the present workspace are shown instead. This greatly affects my workflow as scale was a swift way to swich between workspaces, now I have to activate workspace switcher for that. It's not only a bug in unity. I am using LXDE and I am having the same issue. Also hot corner. I went back to 11.10 just because of this bug. It really affects the productivity. I guess this behavior is wanted. But can the person who did this please point at what they changed so that we can run our own patched version of compiz? I really have problems finding open windows on other desktops again. Also: wasn't the expected bahavior of the unity launcher that when I click an icon it shows me all open windows of that application? If it doesn't do that, why bother at all? This is not a wanted behavior, and it could not be because of the reasons in comment #6. If you look at http://design.canonical.com/the-toolkit/unity-task-switching/ you'll confirm it, and if you check the activity above, you'll see that the developers have confirmed this bug. It just hasn't been fixed yet because its importance was set to low, as there are even more urgent and crucial bugs at the moment. As soon as they fix them, they'll turn to this one. We just have to be patient. Remember what they did with the Alt-Tab: we now have a key combo for changing windows on the current workspace only, and another one for changing windows on all workspaces (Ctrl+Alt+Tab). I've always changed Ctrl+Shift+Up for Super+E to have a key to scale windows from the current workspace only and another for all windows, and it works great. I'm guessing we'll have something like that. I don't think it's Unity overriding the behavior, just the behavior that it's broken. If Unity would override the shortcut for showing all windows for just showing those on the current workspace, we could still use a different shortcut for showing all windows, and that doesn't work either. Changing the behavior of the showing all windows to just showing those on the current workspace when such a behavior is already available wouldn't make any sense, since if that would be the intended default behavior, just the shortcuts would need to be changed. The windows of each workspace are seen flying around, so they are being restored to their original workspace instead of the active one. 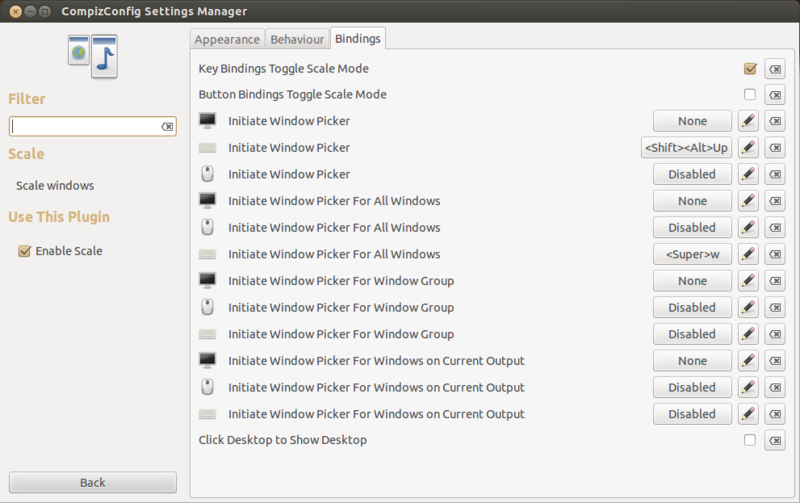 Using the CompizConfig Settings Manager, I am setting the binding for( Initiate Window Picker) to one of the hot corners. This setting gets reset whenever I restart Ubuntu. So, when ever I boot in to my desktop, I need to set the binding again to ( Initiate Window Picker For All Windows) instead. and things work beautifully. Wonder if you could fix this bug. so that Unity ( or what ever ) does not override this setting. This bug affects non-minimised windows too. Open two terminals, on different workspaces, click the "dash" button for your terminal and nothing will happen, because it only sees that one terminal. Worse, if you're on a workspace on which you haven't opened a terminal, pressing the "dash" button for your terminal will pop you to one of the two workspaces that has a terminal, ignoring the other non-mimised terminal in the other workspace. Feras, are your ccsm options all messed up too? Now the options just show their variable names instead of the description of the option... And there are missing options, window resize doesn't have the kind of resizing any more, for example. If I set the binding in ccsm I still get the wrong behavior, it shows the windows on the current workspace and not all windows as expected. Unfortunately, that's not gonna solve your problem. I am on LXDE and the behavior is exactly the same. They messed it up somewhere in compiz. This is not a unity-issue. Maybe we should update the description of this bug, since this is a problem with compiz and not unity? Is the scale plugin used by so few people that this is considered a low priority bug? I can't use this plugin at all, or at least it complicates having applications spread across various workspaces. @ Bruno Yes it a compiz bug, since it affects scale even while not using unity. However, Unity is relying on the scale plugin as part of it window management strategy. Since the broken behavior is a direct result of changes made to support that reliance and fixing it would drastically improve window management within Unity. I'd say this bug is Unity's responsibly as well. The problem here is that Unity is moving away from using scale to handle window management. They are planing on making the "spread" functionality part of Unity itself. So there really is no incentive to fix what they broke unless we can convince them this is really bad to leave unfixed in an LTS release. What I don't understand is why would they change the behavior of the all window picker if there's a just picker for the current workspace. It would make more sense to just default to have Super + w a shortcut for that function instead. Is 71 people finding this behavior a bug, enough? Maybe Daniel van Vugt can tell us what changes may be be behind this? One day until LTS release and this bug is still present. Any news? I am also experiencing some flickers while changing workspaces. If this is not fixed by Monday I will switch back to 11.10. I am the experimental 12.04 switcher for my company and will most certainly hold back the rest or they will eat me alive! I agree with silvio. Unity is actually shaping up quite nicely I have to admit, however its doing so at the expense of the rest of compiz. I'm sure I'm not alone in saying that the only reason I didn't go for a different desktop when unity was forced on us, was because its the only desktop that it didn't do away with the compiz plugins that I have come to absolutely rely on, well so much for that now. If this isn't sorted out soon, my laptop is going gnome-shell, and my desktop is going kde, and most iikely out of spite neither will be on top of ubuntu. cannot be recovered (maybe they stopped being painted?)? but there's probably so much they can do when a release was just published. this is the most annoying regression I have with 12.04, even the shortcut tip that appears when you hold win key says " 'win+w' spreads windows in current workspace ", does this mean it's intended behavior? why? I upgraded to 12.04 LTS on release day (April 26th) and this is the first problem I noticed. window picker confined to current workspace, not all. Also, edge assigned to window picker gets reset every boot and I have to go in and reassigned it again after every boot. It is a very aggravating bug when one is so use to using the feature and it's now broken. that bug has been confirmed, targetted for precise and milestoned, it will be worked soon. The unity team worked hard to get precise out and is get a deserved w.e off work so no need to keep adding "me too" or "asap" comments, those are not useful. while I appreciate that this bug is finally getting the attention it deserves. That description is wrong. The scale "Initiate Window Picker for All Windows" function is completely broken. It isn't just super+w, it just doesn't work with any trigger method or attempting to reassign the shortcut. Try it yourself or read the comments in this bug. Corey, I know it's broken for all methods. There is a good reason to mention "Super+W" in the description however. That is so other people reporting and triaging the same issue will find this bug more easily instead of creating duplicates. At the time of this change it seemed to be specially done in scale.cpp. May have been around the time the l. click on icon was changed to current output only, was quite some time ago. + windows. It shows only windows from curent workspace. - windows. It shows only windows from curent workspace. + not show all windows. It shows only windows from curent workspace. Sorry Seb but your statement about the user data is not valid. I know that in every compiz update i have to reassign all of my modifications in compiz config settings manager because every small compiz update reset them to the default. Hot Corners Modified shortcuts etc . A hack was introduced that not only changed the default behavior for all users, but -- more importantly -- also made it impossible to switch back to the desired behavior. In other words, mucking around with people's configs has already been done. How about we own up to the mistake and fix it? The only reasonable way is to revert the ugly hack, and repair the functionality of 'show windows from all workspaces'. Users will have to update their key bindings if they don't like that it's working again. It won't take them more than a minute. I can also add that I work in a corporate environment and everyone I know who uses Ubuntu here is -not- happy about the hack. Anyway what's the downside to applying the 0.9.7 commit in precise & also adjusting scale.xml.in to get desired results. @seb128: argh. I meant "this fixeD everything" (for 12.10 that is). I know it's only one issue per bug report. But the underlying problem is a single commit and many bugs are connected to fixing this bug correctly (which has been done for 12.10). This bug produces issues for people who don't even use "scale all". Most corporte users don't use scale all but they do see the flying windows. @mc3man: the problem fixing this bug is that if you fix it the default behavior changes and you can't change the user settings on upgrade. The only way to do that is ask for user interaction through a notification (the way it happens when you install Dropbox). That would work but bothering the user with notifications is unwanted, so it won't happen. The way I see it this bug is unfixable with the only acceptable solution apparently being the introduction of a second hack that will (I think) introduce even more problems for the next dist-upgrade. Actually, my fix that got merged (and I think reverted quickly after) removed the hack and introduced correct behavior, with the possibility of switching between the two behaviors. I wonder why it's not actually present in lp:compiz right now. We shouldn't be bothering with introducing different behavior at the beginning of a cycle, right? I think I need to re-enter this bug and try finding a satisfactionary solution for everyone. > what's the downside to applying the 0.9.7 commit in precise & also adjusting scale.xml.in to get desired results. > I know it's only one issue per bug report. But the underlying problem is a single commit and many bugs are connected to fixing this bug correctly (which has been done for 12.10). This bug produces issues for people who don't even use "scale all". Most corporte users don't use scale all but they do see the flying windows. > The way I see it this bug is unfixable with the only acceptable solution apparently being the introduction of a second hack that will (I think) introduce even more problems for the next dist-upgrade. one other way would be to add some "migration code" to compiz itself, e.g have a one time migration, conditional to a flag that will be written somewhere, which could do something like "if scale for all workspace = super-W; then reset it and reset the "scale for one workspace"" so the new default are picked for users who didn't change the action. The only possible issue with the current 0.9.7 commit + .xml change is the possibility of the so-called flying windows. As I mentioned quite some time ago over the course of 60 or so fresh 12.04 installs with a patched compiz the fly aways would sometimes happen only *once* per install, maybe others find differently?? (<super>w - all:, <Shift><Alt>Up - current WS, noting that *in use* Super+W picks from current WS irregardless of binding. Unfortunately an update of compiz has replaced your ppa with Doug's patch. I don't want to bother you but it would be great if you update your ppa. Or better yet if you post a step by step guide how to compile compiz with Doug's patch. - not show all windows. It shows only windows from curent workspace. + not show all windows. It shows only windows from current workspace. Does anyone know how to revert compiz to the version before it broke broke bruno's ppa and then pin it there? Or can we buy bruno some beer to get him to update his ppa?...does he have an amazon wishlist or something? or maybe this is one (the only) reason to upgrade to 12.10 or even 13.04? Been following this bug since 1 year now, hope there is still the intent to have it fixed in Precise. In any case, thanks already for the good work. To add my 2-cent, what is the problem exactly of fixing compiz so that Super-W really does "Initiate Window Picker *For All Windows*", as it is shown in the compiz setting manager? - only such that to show more windows (not less, i.e. more functionality actually). Don't know if anyone has tried/tested other than myself. Tried again on both 12.04.1 & 12.04.2 installs, compiz (1:0.9.7.12-0ubuntu1) source, again see no issues. The scale fix to enable picking from all ws's works fine & patching the .xml patch sets new bindings as intended with already existing user after a log out/in. Apart from "Initiate Window Picker For All Windows" being still broken to date,I would also point out that,once the plugin action (for a single window,obviously...) is initiated,the right-click (or button 3 ) click to exit the plugin doesn't work as it used to in previous compiz versions,which is kinda annoying and also IMHO inconsistent with the usual behavior,still found for instance in the Expo plugin. I'm still having this problem on a fresh install of 13.04 64-bit. @msth67: Please file a new bug about the right-click to exit issue -> I will fix it then. > I'm still having this problem on a fresh install of 13.04 64-bit. Precise is again the best. . . . Yes, Doug is the man. Thanks A LOT for this fix !!! Working flawless till now. Thanks Doug! Working perfectly on my system (64-bit Precise) too. Many thanks. So far, Doug's fix works flawlessly, with no side effects (Precise 32-bit + xserver-xorg-lts-raring + 7300GT + Forceware 304.88). This fix works perfectly in Mint 13 64 bit Mate edition,I can also set custom keyboard shortcuts in Compiz preferences to see windows from all workspaces,no issues-just a note,in my case logging in again via Mint's "new login" didn't do the trick,a full reboot was needed to have things working. As for my comment #189 and reply #191,in reality I can't recall what was going wrong,after this fix now everything is working as expected,with button 3 zooming on the selected window-if anything,the scale addon that makes possible to "pull" a window to another workspace to the current one (when viewing windows from all workspaces) isn't working,but I don't know if that would be worth fixing. All hail mc3man, Doug's fix in comment #195 worked perfectly. I admit that I did not read every word in this comment history, but it seems the bug could be fixed in Precise without changing the default behavior. An updated package could fix the all-windows bug and set all the relevant default bindings to fire only the current-desktop-windows action. This would not change the default BEHAVIOR of the key bindings, or the user experience, but enable a user or admin to adjust the bindings to use the all-windows action if they like. One less PPA a corp, or even an individual, as to be weary of. Apologies if I am missing something or just being redundant, but with all the noise in this thread it is very hard to follow. Doug's fix works here too. Thanks! And thanks to all the contributors for all the hard work! Displaying first 40 and last 40 comments. View all 205 comments or add a comment.